Quickly weigh incoming freight or stock with the Cardinal Detecto EB-15-204 15 lb. electronic bench scale! 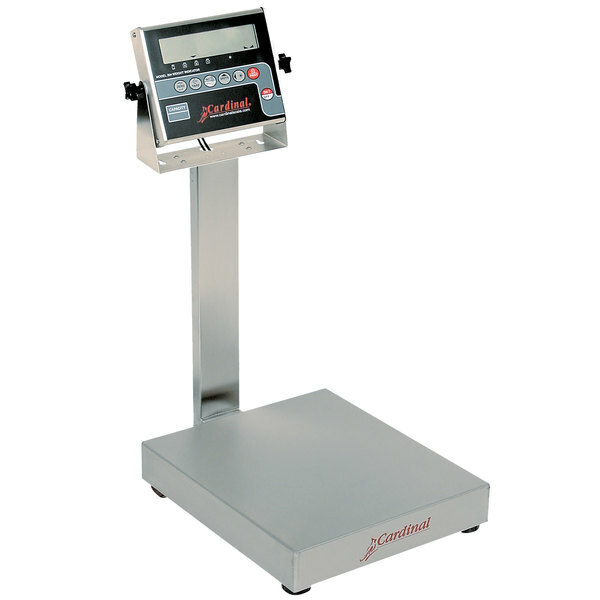 This bench scale features a 10" x 12" platform to accommodate a variety of boxes or crates, and its 1" high clear LCD readout makes it easy to read an item's weight. The platform and column are made of stainless steel for long-lasting durability, and the indicator module has a stainless steel shell to ensure it can stand up to the rigors of every-day use. The easy-to-use keypad includes options for tare, units, and a number of other functions to help keep your business moving. To conserve energy, an automatic shutoff and sleep mode switches off the power after long idle periods, and its versatile power supply accepts batteries or use the included AC adapter. 15 lb. x 0.005 lb. 6 kg. x 0.002 kg.